Look, I like to think I can make with the occasional bit of funny here. But I know who’s in charge. And that Monarch is, of course, The Onion. On Barack Obama’s presidential campaign: Black Guy Asks Nation For Change. ← Welcome Back, Teachers! Try Not To Freak Out! 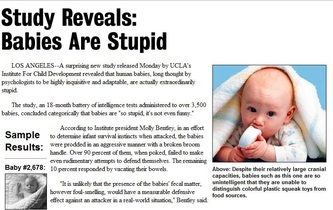 I am continually astonished at the quality and cleverness that comes out of The Onion. 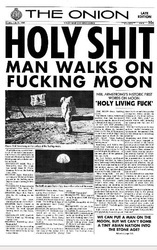 I remember when it started appearing in free newspaper boxes in Manhattan a million years ago. How have they maintained the high standard over the years? Are they warlocks? One of my favs? Yankees purchase every player in the Major Leagues to insure World Series victory. I imagine the pressure to deliver must be insane. Everyone around you is generating greatness, so you have to just think at that level. I’d assume they’re all drunks and have psychotic breaks after a year or so. Maybe that place chews them up and spits them out. I hear that’s what goes on at Saturday Night Live. Same thing except without the big paycheck. Yes! I didn’t realize they’ve been around for 25 years. One of my favorite reads. It’s extremely rare to be disappointed in what they produce. Sooo many to choose from. I used to read it religiously b4 it went online. Not sure why this jumps out but I remember “Running shoes used for computer programming” and “God gives shout out back to all his N***as” that last one being one of my fave stories. I loved the old columns by Smoove, Zweibel, Kornfeld, and that stoner And the old advice columns – Like Ask a touring drummer for the Pointer Sisters or Ask the VoiceOver for the Dukes of Hazard. Thanks for bringing back these memories ! And obviously I shouldn’t be writing comments from my phone. My favorite Onion story: “Third Amendment Rights Group Celebrates Another Successful Year.” It was about the brave efforts of the National Anti-Quartering Association to protest the Third Amendment rights we cherish so much. I like that the Onion has a “25 best headlines of The Byronic Man” on their site today. Nice. I enjoy it when Facebook “friends” post a link to an Onion article thinking it’s real. I have to say the Jenna Bush headline was beyond genius. Especially because someone will then say, “It’s The Onion, idiot. It’s fake.” and they’ll assert that No! This one’s true! I just read that article recently on thoughtcatalog. Hilarious! I was going to include that list! I was afraid I’d be getting too long, though, so I’m glad you did. My favorite might be the congressman who actually thought Planned Parenthood had opened up an $8 Billion Abortionplex. Love that link, JD. Although, I’m not entirely convinced that there really isn’t a small man living inside of Nicolas Cage’s body. Oh my god, I laughed out loud. For real. SO much so, that if I were some illiterate internet junkie, I totally would have written OMG LOL. But I really did laugh out loud. And I’m at work, so I’m getting weird looks. Gotta go now. Thanks for sharing these, darling! The Onion is dangerous to read at work or in public. On your list, this one’s my favorite: Special Olympics Investigated for Use of Performance-Enhancing Hugs. hahaha. They have another great one about the Special Olympics in which they uncover that many of the so-called medal winners did, in fact, do quite poorly. Too funny…”Christian Rock Band Cleans Hotel Room” Classic. There are so many, but this is one of the few I can remember. The article for that one is good all the way through. The scientists are urging people to consider thumbs-ups, or curt nods as replacements. The key to landing a high-five is looking at the person’s elbow, not their hand. Oh my god, Jenna Bush for the win. Genius. I also love the exercise ball and Alan Rickman ones. Oh hell, they are all brilliant. I think one of my favorite ones ever was something like, “Office going away party for boss a little TOO exuberant.” That one might be my favorite just because it hits close to home. Oh how I long for the day . . .
Yeah, that Jenna Bush one is almost too funny to even laugh at. You just have to sort of contemplate the sheer, baffling funniness of it. Like staring into an abyss of funny. Sometimes I hate those guys for being so good. Did you see the thing yesterday? The one about the magic store owner not being the same since he lost his virginity? Oh, I howled. Bless the Onion, the light in a dark world. I avoid the Onion, as it makes me feel like a pathetic loser when it comes to writing funny things. Also, please excuse my not having liked or commented on your blog for the past several months for pretty much the same reason. So many to choose from! The Al Gore one is sad AND funny, but mostly sad. The Abortionplex one is awesome. My favorite is the relatively recent “Chick-Fil-A Debuts New Homophobic Sandwich” (it’s the Queer-Hatin’ Cordon Bleu with Fag-Punching Sauce). That Al Gore picture had me spewing cheap, white wine all over my computer. Hope I didn’t get you in the eye, B-man. You’re right. The Onion rules. The Jenna Bush headline gets my vote. 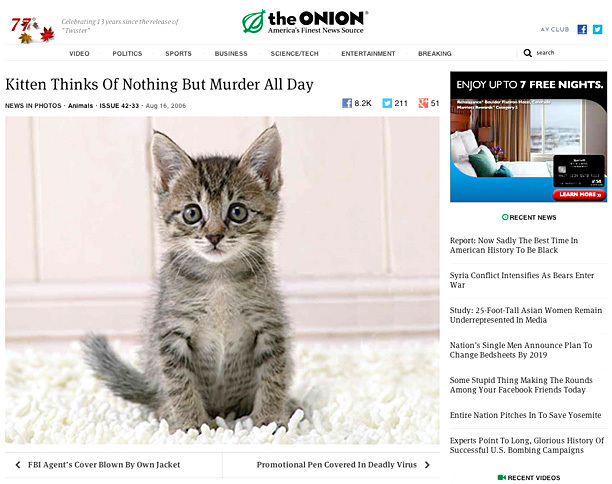 I’m not really a cat person, but I love the kitten headline. Cracked me up. They seem like a shady species. To this day I can not read out aloud the classic Onion article, “Ask Sir Mix-A-Lot”, without laughing so hard that tears stream down my face.